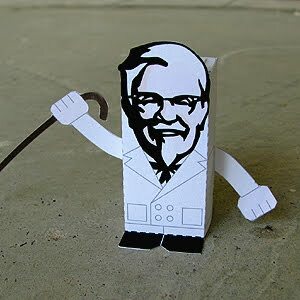 This paper toy is the Colonel Sanders, the papercraft is designed by Toy a Day. Harland David “Colonel” Sanders was an American restaurateur who founded the Kentucky Fried Chicken (KFC) fast food chain. He had a flair for promotion and a dedication to providing quality fast food. His icon picture appears on their boxes to this day, and a stylized graphic of his face is a trademark of the corporation.